I’m probably the last person on earth to read this, but I will nonetheless treat this review as though I’m not. I will also confess that it was the movie trailer that finally made me pick it up, though it’s vaguely been on my to-do list for a while — and I’m so glad I did. Divergent is an intriguing and exciting ride, high-octane and full-throttle. 16-year-old heroine Beatrice lives in a future-Chicago that has been isolated from the rest of the world. Its society is split into five factions, each of which espouses a different virtue: Erudite, which values learning; Dauntless, which values courage; Amity, which values friendship; Candor, which values honest; and the faction Beatrice was born to, Abnegation, which values selflessness. At the age of 16, each member of this society can choose to stay with their home faction or to join another — but they only get the chance once, and before they do, they take a psychological test which reveals their aptitude for one or another. When Beatrice takes the test, however, the results are “inconclusive”. She learns that she is something called “Divergent” — and that it is a dangerous thing to be, though no one will explain why, and she’s told to keep it a secret. When her Choosing Day comes (and this is a spoiler, but I can’t really talk about the rest of the book without it, so, here goes), Beatrice somewhat impulsively decides to leave Abnegation and to join Dauntless. Her initiation process is fraught with peril and terrors. The Dauntless value the conquest of fear, generally through the confrontation of it — and this also includes the confrontation of pain. Beatrice takes on the new name Tris and has to prove herself worthy of inclusion in the faction, or face being tossed out to join the factionless — portrayed as tragic figures without homes, families, or purpose. She quickly earns both friends and rivals, though even her new friendships are far from certain, given the competitive nature of the initiation process. She also discovers a rift between Four, her trainer, and Eric, one of the Dauntless leaders, representing two different versions of the faction’s values — Four, interested more in truly conquering the fears within, and Eric, interested in brute force and the acquisition of power. The story is interesting both psychologically and sociologically. I like what it has to say both about the human mind and about the nature of societal constructs. 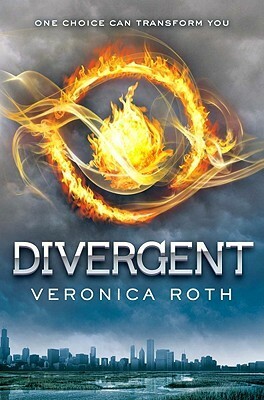 As the story progresses, Tris becomes more aware of the moving parts of the adult world that she’s been sheltered from most of her life, and she realizes that none of the five factions are quite what they were in the beginning, or what they claim to be, or what they perhaps wish they were. I also really like the idea that, over however many generations, these virtues have all degraded into vices. The story of the trilogy, I’m sure, is going to be about re-assimilating those disparate parts into a functioning whole — hinging, it would seem, on the Divergent, which is of course why those currently in power are so afraid of them and want to eradicate them. It’s an intriguing dynamic, and I look forward to seeing it play out. There’s a lot about this book that feels derivative, but I don’t necessarily mean that in a bad way. The Choosing and the factions definitely have echoes of Hogwarts Sorting, and the overall tone of the book definitely feels a lot like The Hunger Games. Katniss and Tris could easily be living in the same universe, just a century or so apart. I was also thinking as I was reading that it had a lot of similarities with The Giver, and then Roth confirms in an interview at the back of the book that that is, in fact, one of her childhood faves. (You can feel that influence particularly in Abnegation and what little we see of Amity, I think). But Divergent doesn’t feel like a rip-off of any of these things — they just seem to be in conversation with each other, which I enjoy. The romance in this book feels much more natural than in a lot of YA — it has a chance to develop over more time in-world, it’s confused and by turns both hesitant and impulsive, and Roth lets her teenage characters have both sexual desire and sexual reluctance. That’s only one element that makes Divergent rather a more mature YA book than others I’ve read. The violence is another — it’s unrelenting, even moreso, I think, than in The Hunger Games. That might come down to the use of guns — somehow that seems more real than a bow and arrow or a sword. It happens fast and casually at first, then with brutal severity, and Roth seems willing to describe injuries in more graphic detail than Collins. The book’s biggest weakness is that it, like so much YA fiction, is written in first person present, which I personally just don’t care for. I think it forces authors into a lot of awkwardness, particularly when it comes to exposition — and I’m someone who would always like to see more sides of the story, rather than just one character’s experience. It also means that, since the reader gets spoon-fed certain information that totally gives away a “big reveal” right from the star, it makes Tris seem a little dim for not putting it together. I’ve seen some other reviewers criticize the book’s pace, and I didn’t have a problem with that — while it does take a while to get to the “main plot”, the rest doesn’t move slowly at all, in my opinion. I was easily caught up in Tris’s dilemmas and her struggle to prove herself. Those challenges drive the first few hundred pages with enough force and energy that I didn’t mind how late the macro plot came in. Tris’s micro plot was plenty captivating. On the whole, Divergent is thoroughly entertaining, start-to-finish. I look forward to reading the rest of the trilogy. A Coda: What, like I wasn’t going to take the chance to pontificate about what faction I’d be in? Definitely not Abnegation or Candor. Selfless, I am not. Generous, but not selfless, and I choose the people I want to be generous towards very selectively (because I am, also, a Slytherin). While I am generally honest, I’m not necessarily open all of the time — I’m prone to sins of omission and white lies of a protective nature. So… Amity, Erudite, or Dauntless? What draws me to Amity is that they appear to be the only one of the five factions that still places any value on the arts — but otherwise, I’m pretty sure I’m not happy-go-lucky enough, nor of a pleasant enough disposition, to fit in there. Erudite? I am intellectual and curious, and I like learning, but I’m not always logical, and their intellect certainly seems to focus on maths and sciences, not on verbal or creative intelligence. My academic strengths and the things I like to explore aren’t the ones they value. The question, really, isn’t what I think now, but what I would’ve chosen at the age of 16, and I can say with certainty that it would’ve been Dauntless. The badass aesthetic certainly would have appealed to me, as would the idea of turning myself into a warrior. Those were things I yearned for. I wanted to be both tougher and more exciting than I was. And I think the ethos of facing fears and conquering them has great appeal — a lot of my life has been about clawing my way past one obstacle or another. My attitude has always been that if I want something, of the world or of myself, I’m going to have to tear it out with my teeth. I have a lot of fears, really, and mostly I avoid them, but I can grit my teeth and steel my way through them if necessary — and if I had to do that more often, I suspect I’d be a stronger and better person. No idea whether I would have survived the initiation process (I can imagine all too well what terrors would’ve been in my simulations), but I like to think I would’ve responded well to the challenge. Shakespeare on Theatre is a good entry-level exploration of how Shakespeare’s plays comment on the conditions of Shakespeare’s theatrical world. From company structure to architecture, from prompters to casting, from prologues to epilogues, de Somogyi provides a compendium of Shakespeare’s commentaries on the theatre. What’s best about this, I think, is that de Somogyi shows that those references don’t only turn up in the expected places — the plays-within-plays in Hamlet, A Midsummer Night’s Dream, Love’s Labour’s Lost, the self-aware prologues of Henry V and Romeo and Juliet, the masque of The Tempest. Rather, the book also explores the subtler and smaller intra-theatrical instances. He reminds us of Cleopatra’s horror of watching a child actor “boy” her greatness on a rudimentary stage, of Macbeth’s metaphor of death as the ultimate exeunt omnes, of Margaret costuming the Duke of York with a paper crown. De Somogyi also does well to expand his explorations and include examples from other playwrights, many of them more overt in their self-referential moments, such as Ben Jonson’s various admonishments to the audience, or the appearance of actors Burbage, Condell, and Lowin as themselves at the top of Marston’s The Malcontent. The book includes snippets of poetry and of polemics both pro- and anti-theatrical, giving a broader view of the role of playhouse culture in 16th- and 17th-century London. Throughout, de Somogyi connects the conventions of Shakespeare’s theatrical world to examples of how those conditions have changed — or stayed similar — through to the modern age. It’s also pleasing that he typically off-sets terms like “metatheatrical” or “fourth wall” with quotation marks in recognition of the fact that those concepts, while common to theatre today, would have been alien to Shakespeare’s company and their audience. Curiously, he seems less interested in that interplay when it comes to characters who “perform,” unless they do so explicitly. In The Taming of the Shrew, for example, he devotes considerable attention to the frame story involving Sly and the Players, but none at all to Petruchio’s various performances within the text. Nor does he consider the theatricality inherent in kings speaking to royal courts or to the commons. The deposition scene in Richard II, the fraught peacemaking of King John and King Philip, Richard III’s pretended reluctance to assume authority — these would all seem to be fruitful for what they have to say about the intertwining and overlapping of performing on the stage and performing in life (and about the blending and manipulation of on-stage and off-stage audiences), yet de Somogyi does not plumb them for their potential. The overall effect of the book is to remind the audience that, as de Somogyi points out explicitly more than once, a playwriting was “a functional craft”. Shakespeare on Theatre goes a long way towards de-mystifying the idea of theatre as sacrosanct art. Modern culture tends to designate it as an emotional enterprise, but the early modern reality was much different. 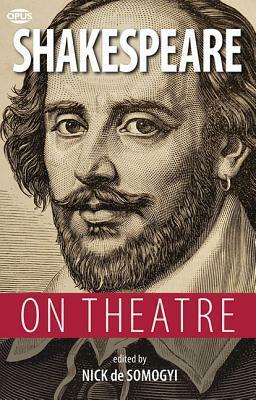 The book peels back the romantic notions and exposes the business of theatre — and demonstrates clearly that Shakespeare was a man who knew the practical aspects both on the production and the financial sides. The book’s main flaw, in my opinion, is its freedom of conjecture. De Somogyi does not often enough qualify his pronouncements on Shakespeare’s life with the necessary disclaimers. I worry that someone approaching this book with a less solid grounding in the subject matter might take his narrative constructions as true biography. It’s even more concerning that this trend begins on the very first page of the introduction to the book. De Somogyi begins with the admirable opening statement that Shakespeare “was a working man of the theatre to his core,” but from there slides effortlessly into an imagined sequence of events — a lovely fantasy, of a “stage-struck boy” eventually “talent-spotted by a later touring troupe” who grew from an actor with “precociously impressive skills as a textual fixer” into the greatest playwright of the age. There are perhaps even some probabilities mixed in with the inventions, but they are still only conjectures, not evidenced facts. De Somogyi seems to assert things as truth that we cannot know for sure. More imaginative declarations of this type take place throughout the book, along with other generalizations about early modern theatre that I feel could have used some end-noted explanations. With that caveat, however, I can generally recommend this book as a solid introduction to the interwoven dialogue between play, playing, and playhouses. Devoted scholars aren’t likely to find anything new here, but the book is accessibly written and a comfortable first step for someone who might then move on to deeper examinations like Gurr, Stern, or McDonald. It also might serve as an interesting source of monologue material for auditioning actors. Many of de Somogyi’s selections are the appropriate length, but a different variety than typical guides provide.